Sometimes the best intentions fall flat, and sometimes the reason is you tried too hard. 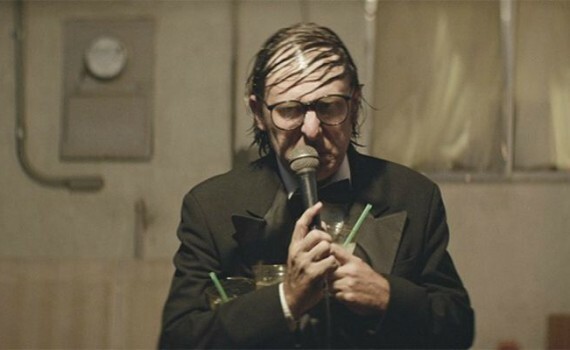 Rick Alverson directs his forth feature, a filmography that’s quickly becoming too bleak to be. His films are about men who want to give up on life, his posters presenting his heroes in stark black & white, emphasizing their helplessness. Yeesh. It’s all a bit heavy, and you hate to say it, but the guy could do with a tiny dose of Hollywood regularity to help make his projects more approachable. Sometimes you try to be artistic, you try to make a statement, you try to work outside the box. But sometimes you just need a little normalcy to keep things settled, attract an audience, and to allow you to sit back & let your message soak in. Alverson tries too hard perhaps, and Entertainment is the result. Our protagonist is a nameless, traveling comedian whose current tour takes him into the heart of the Western dessert. And by tour I mean appearances at terrible bars, parties, and even a prison. His comedy is …unusual …and stems from a character he has created with a wicked combover, an insulting sense of humor, a wet head, three drinks in hand, and absolutely no charisma. Oh, and his opening act is a young man dressed as a hobo clown who dances, claps, and pretends to poop in a hat. No wonder our hero hates his life; motels, heat, stupid tours, weird locals, and no appreciation whatsoever. It’s a drab existence made worse by a lack of success in any area, but the show must go on. I guess. With one of the strangest plots you’ll soon see, Entertainment is a lesson on the difficulty of filling your life with meaning, and how that lack of fulfillment can lead you down a very unpleasant path. There’s some good stuff here; the comedian’s weird, upsetting routine, his oddball sidekick (Sheridan), a cousin seen along the way (Reilly), the ever-present drinks in hand (which I found hilarious), and the oppressive, foreboding sense that this cannot end well. But there was enough wrong to overbalance the film and send it spiraling into a very dark place. Too slow, too artistic, too dreamy, with not enough substance & plot; this movie could have done with a healthy ration of regular movie-making. I hate to say it, and I’m no fan of Hollywood mainstream, but sometimes we just need a little relatable content, a few light moments, something to allow us to breathe before you tell us that life has no purpose.